The announcement says that Mr. Gore will be publicly renouncing his portion of the Nobel Peace Prize, which was awarded to him in 2007 for his tireless efforts to raise global awareness of the climate crisis. In fact, he will no longer be referring to the fight against a ‘climate crisis’, but instead the fight will continue against a “global energy crisis”. 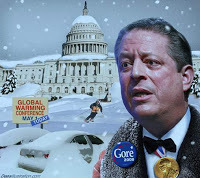 There is also the hint that he is considering returning his Academy Award for best documentary, although he hopes that a new movie category (best movie, science fiction) will be created to accommodate his highly acclaimed motion picture on global warming, An Inconvenient Truth. HAHAHAHA if only it wasn't April 1st….